Good Samaritan Society – Echo Ridge, located on the south side of Rapid City, is currently seeking a caring and dedicated team member to fill the position of a full-time Certified Nursing Assistant (CNA). To qualify, you must be a current CNA or be eligible to take the State certification exam. Starting wages range from $13.00 to $14.35 (depending on experience). They also provide shift differential of $1.00 for night shift. Working every other weekend is required. Good Samaritan Society Echo Ridge is a Senior Living community that offers Apartment Homes with Services and Assisted Living Apartments where Residents are blessed with a beautiful setting and opportunities to socialize while living a comfortable, maintenance free lifestyle. Applications and a complete job description are available at www.good-sam.com. For more information, please contact Loren Mohr at 605-721-6052. Full-time/part-time Ninja coach. The pay is dependent upon experience. A part-time recreational coach. The pay is dependent upon experience. Ninja director who would do administrative work in addition to coaching. Party staff to work part-time on weekends. The pay is per event. For more information about any of the positions, please email justjymkids@gmail.com. Why register? Job seekers can upload their resumes to be viewed by employers ahead of the event. Requires 2-3 months of Navy/Air Force electronic courses and 4-6 years experience troubleshooting to board and/or component level. Prefer AT, BMET, ET, FC ,or PMEL or comparable rates. Must have excellent communication skills. Will travel a 400-600 mile radius from home base city by company vehicle or by commercial air and rental car. Will install troubleshoot, and maintain optical measurement instruments. Prefer a motivated, energetic E-4/E-5 with superior Navy /Marine Corps/Air Force Evaluations and one or more Navy/Air Force Achievement Medals or Letters of Commendation. Company laptop, gas mileage, and performance bonuses between $8000 and $12,000. Top benefits. Honorable Discharge, Good Credit and Driving Record and Valid Passport required. Must have December or early January availability for company training class. Please call or write to Lester Neale: (770) 518-8040 or 678-457-8546 (mobile) Please e-mail resume to:lester.neale@att.net (Word 20007 or later) or PDF format only. 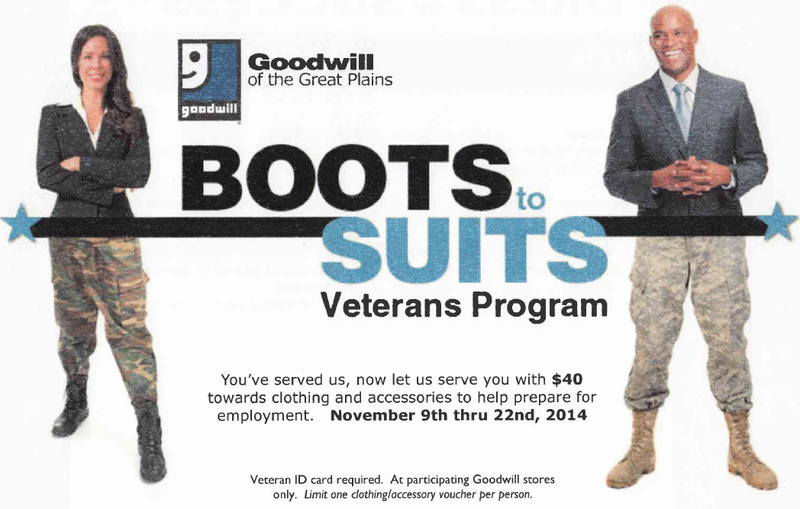 The Goodwill of the Great Plains, which includes the Rapid City Goodwill Store, is offering veterans a $40 voucher towards clothing and accessories to help prepare them for employment. The offer will be from November 9th thru November 22nd, 2014 and you must present a veteran ID card at participating Goodwill stores. Limit one clothing/accessory voucher per person. We have confirmed that the Rapid City Goodwill Store is participating.